Central Park Zoo in New York. For both adults and children you can visit the Zoo in Central Park. Visit penguins, bears, brightly-coloured birds, monkeys and seelions etc. You will find all animals at Fifth Avenue and 64th Street. Opened whole year around. Absolutely not: Even if the park feels safe, you should be on your guard in certain areas - preferably in area of woodland and north of 95th St. on both sides. Don´t walk in the park after sunset. The Zoo from today have been here since 1988. But history wise there have been animals here since much further back in time. Since 1860 you have been able to find different animals here. From the beginning there was a growing group of donated animals as for example 72 white swans and one bear kid. In 1864 the city was allowed to start a Zoo. Year 1934 after reconstruction the Central Park Zoo was created. When the time passed the place got to miserable for the animals so in 1980 it was decided that the zoo should undergo a bigger renovation. The restoration was done Aug 8, 1988 and the new Central Park Zoo opened. Wild animals in the middle of the town. Today it is visited by nearly 1 million visitors per year. You will find the warm rainforest and the icecold winter of Antarktis. Here you can view penguins, parrots, monkeys, sno leopards, polar bears* and grizzly bears*. Here are about 130 different species. Central Park Zoo is active with preserving species under threat of extermination as red panda and the tamarin monkey. For the little kids, you can visit "Tisch Children's Zoo." Here is a little like our "Children zoo" in Slottsskogen in Gothenburg. Here children can pat and feed animals like pigs, goats, sheep, cows, etc. They will also learn how the animals sounds and can watch a theater play on stage "Acorn Theatre". You can visit Central Park Zoo the whole year around. For prices, see local information. 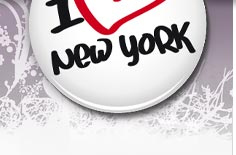 *The loved polar bears in the Central Park Zoo is unfortunately no longer there. The 27-year old Gus had to be put down in 2013 after a long period of illness. He had been here since 1988. Even his friend Ida has died (2011). 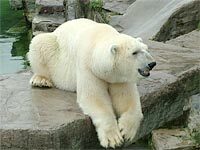 Now the idea is that new animals will move in where the polar bears used to live. 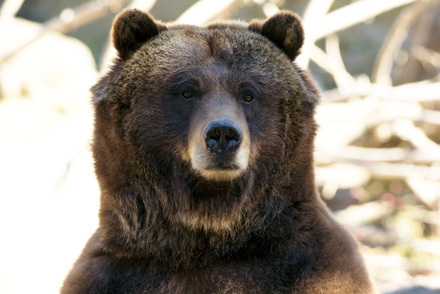 Now it's time for Grizzly Bears to stay here. There are two bears named Betty and Veronica who will live here. They have been rescued from Montana and Wyoming. They have since 1995 been living in the Bronx Zoo. We slipped in for few years ago ....! 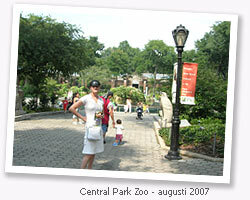 After visiting New York on several occasions, we thought that now we can not miss the zoo in Central Park. In August 2007, we went there. It was a beautiful hot summer day, around 27-28 degrees and the sun was shining from a clear blue sky. They have escaped to Madagascar! The film Madagascar took place here at Central Park Zoo. One reason that we wanted to see the zoo also was to see if the lion, zebra, giraffe and hippo had escaped to Madagascar - and they had - they were not there:). However, the penguins have returned. They live in a world behind glass in the cold they need, (see top images). The zoo is not so big but there are some animals to see. There is also an indoor part which holds a piece of the rainforest. We who have Universeum in Gothenburg was thinking that perhaps it is from here Gothenburg got the idea for an indoor rainforest. You go around among plants and animals. Some animals are behind glass, but some will walk or fly freely around. Can be a little crowded when many visitors are here at the same time. We saw colorful frogs, snakes coiled up and monkeys. See an interactive map of Central Park Zoo.